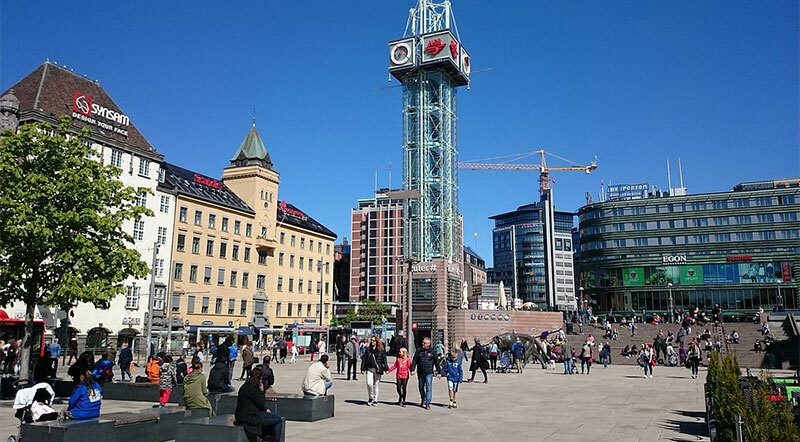 Despite other travelers claiming all of the English guidebooks at our hotel, we managed to find plenty of free things to do in Oslo. This is a good thing since we’d need all our funds just to eat. 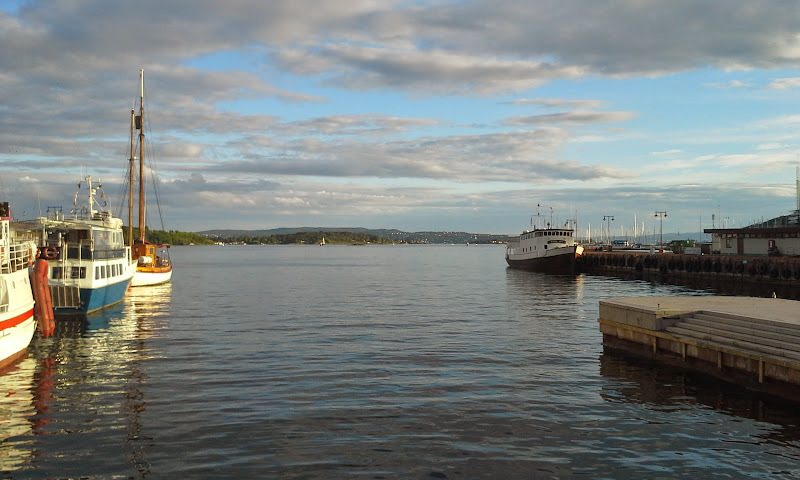 One of the first things that we did was walk the grounds of the Akershus Fortress in Oslo. It’s quite a large area with plenty of old buildings, a pond, old cannons and a cool fortress wall. You can get a pretty great view of the harbor from the fortress, which makes it totally worth the walk. There are also lots of flowers and blooming trees, which makes it a very pretty place to explore. Riley included our exploring of Akershus Fortress in the Instagram video below. One morning we walked up to the Botanical Garden in Tøyen. It didn’t look that far on Google Maps and walking there was supposed to take around 25 minutes. Funny thing about Google Maps, it doesn’t tell you when the walk is all uphill and thus takes a wee bit longer. To reward us for sweating it all the way up there, Mother Nature decided to start a torrential downpour about 10 minutes after our arrival at the park. And thus began our walk back to the hotel…in the rain. But, once the rain stopped it was a lovely day that we spent walking around Oslo. Riley lost the video from that morning, but the video below catalogs the rest of the day. Day 2 Oslo, Take 2 – The original video showing this morning's torrential downpour was lost. 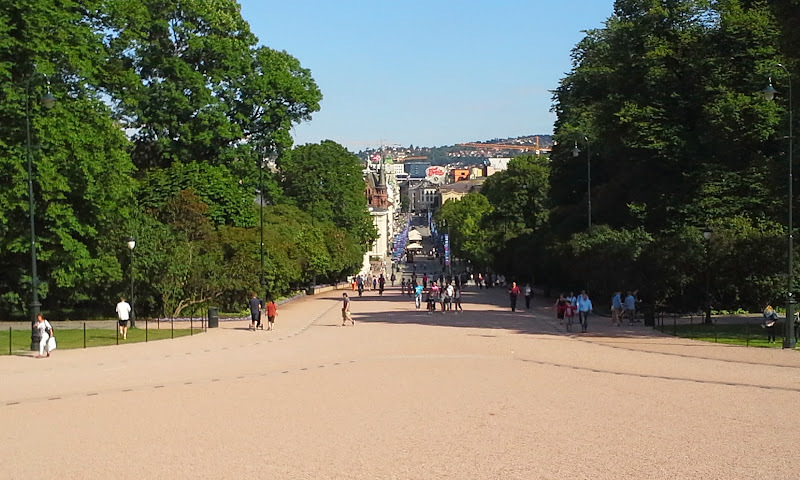 The Palace Park is at the end of the main strip in Oslo, and you can see the palace from most points as you’re heading towards it since it sits atop a hill. Obviously, this means that you do have to walk up a hill in order to actually reach the palace, which you should do. Not only is it a nice building, but there are guards posted outside and if you’re there at the right time then you get to see the changing of the guards. 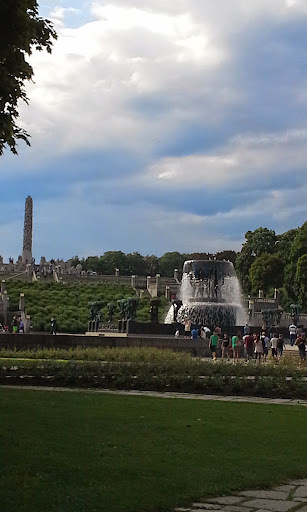 Also a bit of a trek from the city center, the Vigelandsparken Sculpture Park in Frogner is definitely something to check out on any visit to Olso. You can take public transport there if you don’t want to walk, however the neighborhoods that you go through when walking are quite nice. 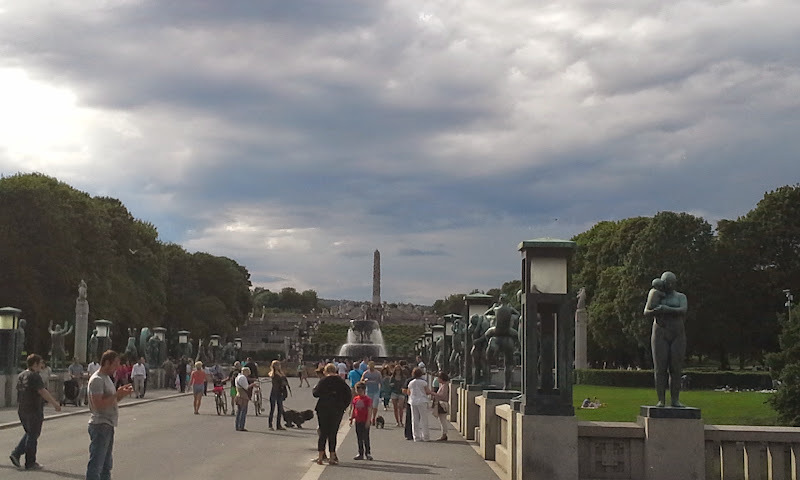 The park itself is also quite expansive, with far too many sculptures to count. And yes, each of them is of one or more person in their nudie pants. Overall, it is a great place for walking and or biking (if you’ve rented a bike for the day). Note that there is one public restroom located at the entrance of the park. You do have to pay to use it and the cost is the NOK equivalent of about $2 USD. Or, you can catch the door as someone else is leaving since there is more than one stall inside. Do know that there is a bathroom monitor in the adjacent cafe who will come out and guard the toilets if multiple people are seeing doing this. Or, if some donkus decides to hold the door open.